This is a plug-in for the MS Excel that lets you insert and view images into a spreadsheet cell. 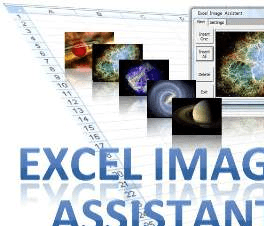 Excel Image Assistant enables users to view images through Excel cells data. It also inserts images into Excel spreadsheet cells. One of the uses you can put it to, is that you can add product images quite easily along with detailed product data. It is a convenient way to design product catalogs. The application also makes it easy to view pictures in Excel. You can have a unlimited set of images attached to a cell, if required. The interface thus you get is the familiar Excel spreadsheet, Except that now you have a small icon for the image attach/viewer plug-in. When you click on that you have a pop up opening that is the main area you work through when you want to attach an image or to view it. For loading an image the pop up works closely with the file explorer. You can drag things in or specify a file path. You can visually see the directory structure so that finding a file is not too difficult. Overall, the whole thing is simple enough for newbies to get started quickly too. All said and done, product catalogs are not just some data and images. It is more like nice description surrounding an image, specifications details etc. most commonly in a book form. So for typical catalog viewer crowd, this format may not be a suitable one. However, there is one situation where this app can fit in very well. Many comparison shopping sites require product data in excel sheets including images if any. This could be a very handy and productive tool in those situations. It does its job of attaching an image to a specific cell in Excel sheet quite well. With this time saving add in you can:Insert pictures in Excel, insert pictures into cell comments, insert picture file names into cells and view pictures in Excel.Just a few clicks away you can insert hundreds of images into Excel spreadsheet cells.If you don't like the result , simply click delete all, change size and re-insert them with one click. It is a convenient way to design product catalogs and/or view pictures in Excel. Whether you have hundreds or even thousands of product images related to Excel spreadsheet cells, then this program is what you need.